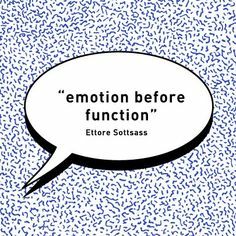 On December 11, 1980, Ettore Sottsass called a meeting between a group of international designers. This meeting was the first interaction between the designers, who in 1981, would form the collaborative Memphis Group (or Memphis Milano). The name was inspired by Bob Dylan’s “Stuck Inside of Mobile with the Memphis Blues Again”, which played repeatedly throughout that first meeting. Founding members include Alessandro Mendini, Martine Bedin, Andrea Branzi, Aldo Cibic, Michele de Lucchi, Nathalie du Pasquier, Hans Hollein, Arata Isozaki, Shiro Kuramata, Matteo Thun, Javier Mariscal, Luciano Paccagnella, George Sowden, Marco Zanini, Ettore Sottsass, and the journalist Barbara Radice. 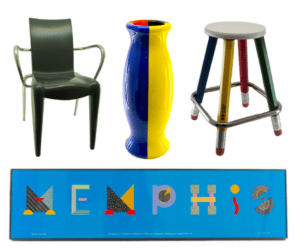 After its 1981 debut, Memphis Milano dominated the early 1980s design scene with its post-modernist style. It took its inspiration from design movements such as Art Deco, Pop Art, and 1950s Kitsch. Following their highly-acclaimed debut at Milan’s prestigious Salone del Mobile, the group created furniture and design objects from 1981 – 1988. Furniture, fabrics, ceramics, glass and metal were their favourite mediums to work with. Their designers were characterized by asymmetrical shapes, bold colour palettes, vibrant patterns, and futuristic themes. Caption: Ettore Sottsass, “Suvretta” Bookcase. George James Sowden, “Unknown” Table. Michele De Lucchi, “Riviera” Chairs. Photo © Jacques Schumacher. The group’s work has been described as “bizarre”, “misunderstood”, “loathed”, and a “shotgun wedding between Bauhaus and Fisher-Price”. Famous patrons of Memphis design include Karl Lagerfeld and the late David Bowie, both boasting impressive collections. Lagerfeld’s early 1980s Monaco penthouse was a shrine to the design movement. It was captured in a 1983 interview between Lagerfeld and Regina Spelman and her photographer husband Jaques Schumacher for a little known German fashion magazine called ‘MODEundWOHEN’. 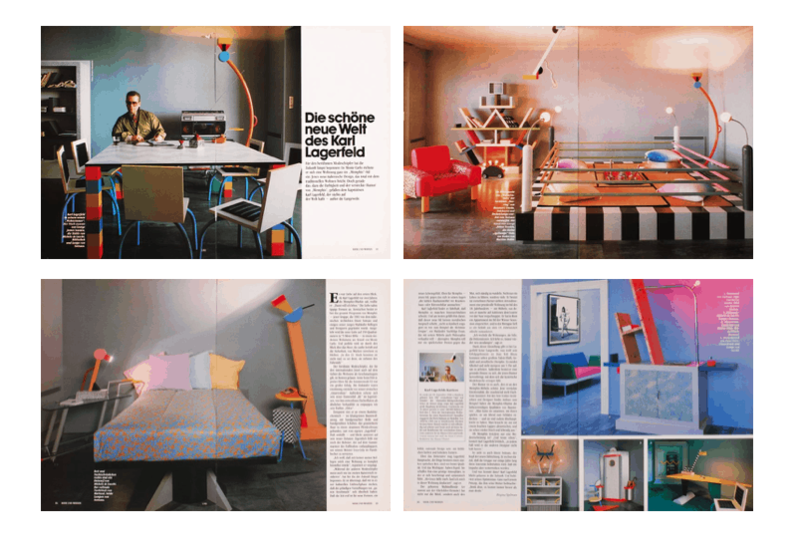 Pages from German publication MODEundWOHEN, featuring Karl Lagerfeld’s Memphis Monaco Penthouse, 1983. Source: We Heart. Up until his death last year, David Bowie was an avid collector of works by the Memphis Milan group. His personal Memphis Milan collection boasted over 100 unique pieces and was sold at Sotheby’s on November 11, 2016, in an auction that included over 400 of his personal items. The entire collection fetched over $55-million Canadian dollars. Notable items in Bowie’s collection included Peter Shire’s Big Sur sofa, Olivetti’s ‘Valentine’ Portable Typewriter, and Ettore Sottsass’ Don table lamp, Enorme telephone and Carlton bookcase. 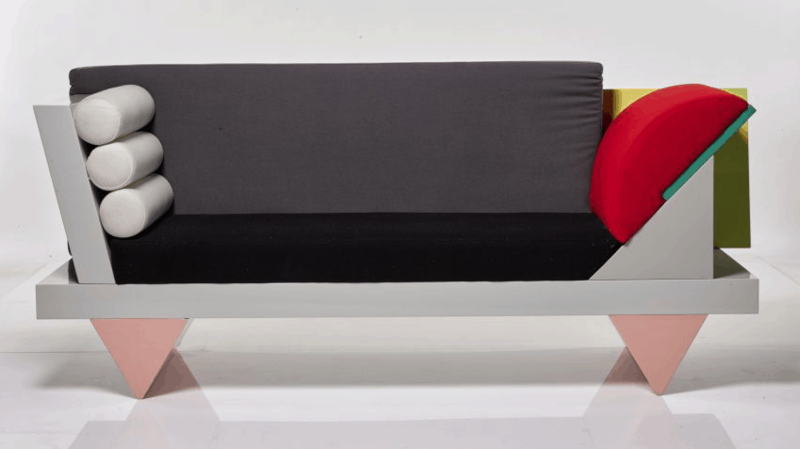 “When you look at a piece of Memphis design, you see their unconventionality, the kaleidoscope of forms and patterns, the vibrant contrasting colours that really shouldn’t work but really do,” said Cécile Verdier, co-head of 20th-century design at Sotheby’s. “The works produced by the historical avant-garde design collaborative Memphis Milano, led by Ettore Sottsass, could not have found a more receptive and tuned-in audience than David Bowie”. 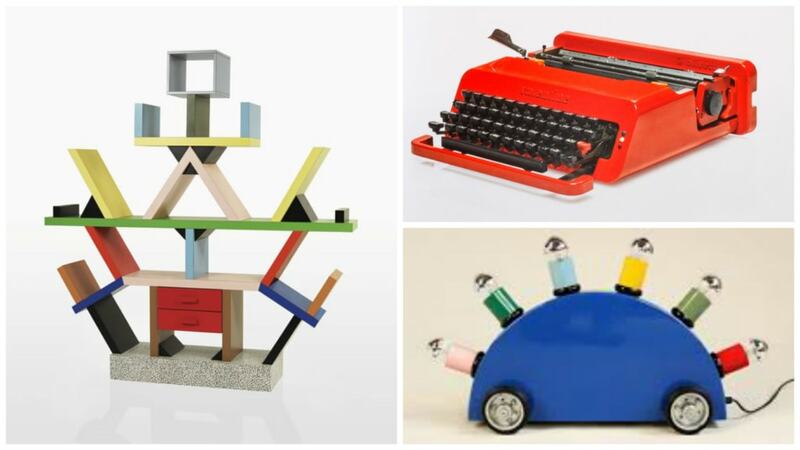 Clockwise from left: Ettore Sottsass’ “Carlton” Room Divider, 1981; Ettore Sottsass’ Olivetti “Valentine” typewriter, 1969; Martine Bedin’s Super Lamp, 1981. When Atomic Design, a lighting and furniture shop located in Toronto, opened its doors in 2008 they were one of just a few shops in Toronto offering Postmodern and 80’s design. After more than a decade of involvement in the world of decorative art and jewellery, both in the United Kingdom and Canada, owner Lawrence Blairs made the decision to open an intimate boutique in the heart of Toronto´s Art+Design district to share his passion for twentieth century art and design. At that time, this genre of design was very lukewarm and extremely niche; most of the interest came from architects and a handful of collectors. Visiting the shop is like walking into a design museum, with Blairs acting as a willing and knowledgeable guide. The shop showcases a mix of unique furniture, art, lighting, modernist glass, jewellery and objects from the early 1960’s through to the mid 80’s. Browse through their curated list of items here. Clockwise Left to Right: Philippe Starck ‘Louis 20’ Armchair; Alessandro Mendini ‘Diderot VI’ Floor Vase; Pencil Plus! Stool; Memphis Exhibition Poster. Although the movement only lasted a short time, the impact of Memphis is still very much felt today. We’ve seen a buzz around Memphis Milano in the fashion and design worlds, instigating a bit of a revival. Of course, the timing of David Bowie’s Sotheby’s auction is right on trend, further positioning him as the king of everything, even in death. In Christian Dior’s Fall 2011 Couture Collection, the fashion house’s first without John Galliano, we saw Bill Gaytten transform the Dior women into the most excellent examples of Memphis sensibility. The collection was not well-received by critics, but lovers of the design movement were thrilled. Bill Gaytten’s Christian Dior Haute Couture Fall/Winter 2011 show during Paris Fashion Week. In 2014, Natalie du Pasquier designed a Memphis line for American Apparel. An original Memphis Milano member, she’s best known for her bold, signature prints. 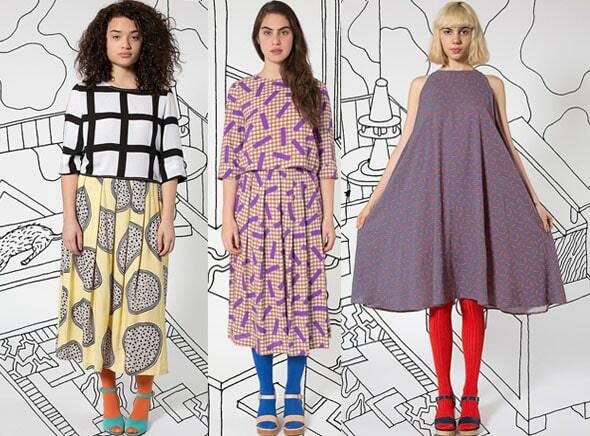 Natalie du Pasquier’s 2014 Memphis line for American Apparel.